Having reviewed numerous children’s playhouses for several years, we assure you that this wooden playhouse is one of the most beautiful and safest ones. If you’ve been struggling to control your children’s behaviour, this playhouse has come to your rescue. It comes complete with all the features your children need to have fun. The product was designed with children in mind and will keep them amused throughout the day. We were impressed by the 4 fixed windows and the half-glazed door. 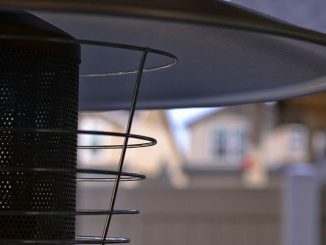 These provide enough ventilation for your children, especially when playing during the summer months amid warmer temperatures. 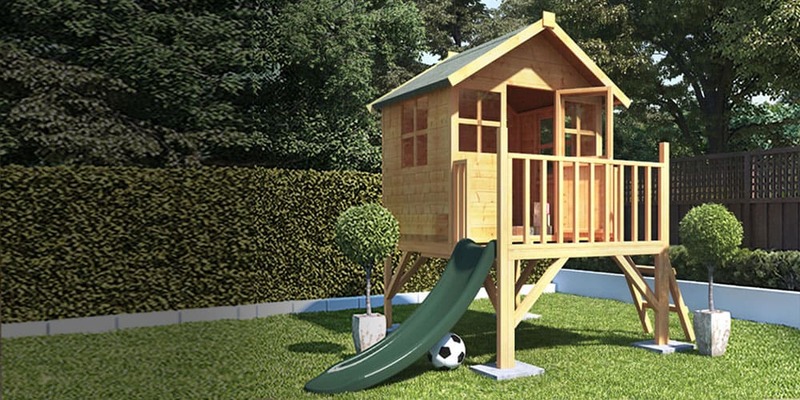 In addition, the raised tower design gives the wooden playhouse a modern appeal that will add some décor to your garden. Included with the wooden playhouse are a solid sheet roof and floor. The roof is made with dark grey sand felt to protect the young ones from the damaging UV rays of the sun and also provide waterproof protection from the rain. Water penetration will not occur because of the interlocking and durable wood. 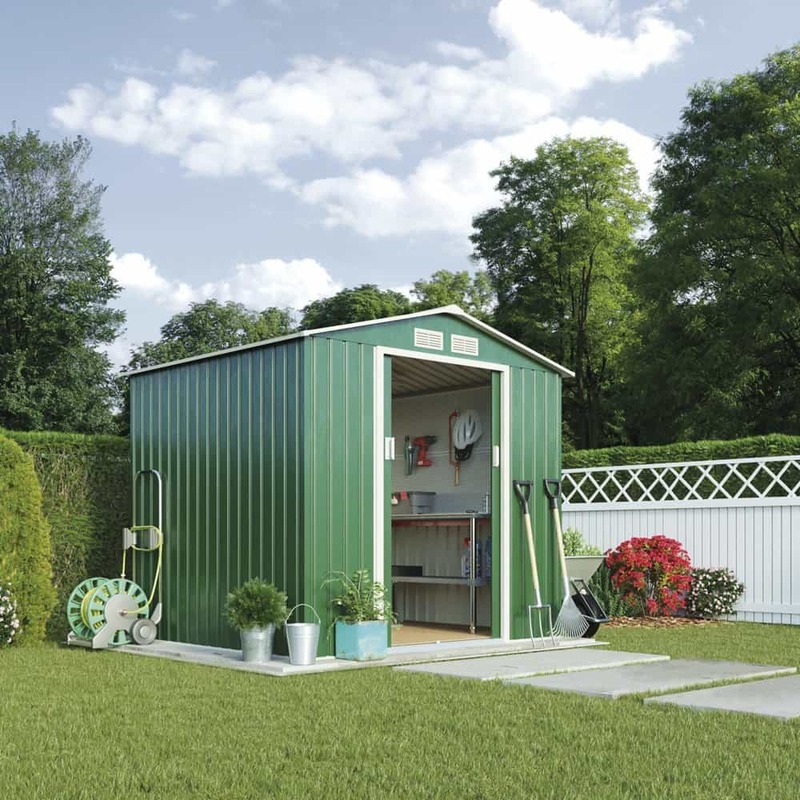 At Garden Shed Reviews we don’t list pricing of the garden sheds we review for one simple reason. They would be out of date the second we publish the review and we would be constantly modifying our content to try and keep the pricing up to date. 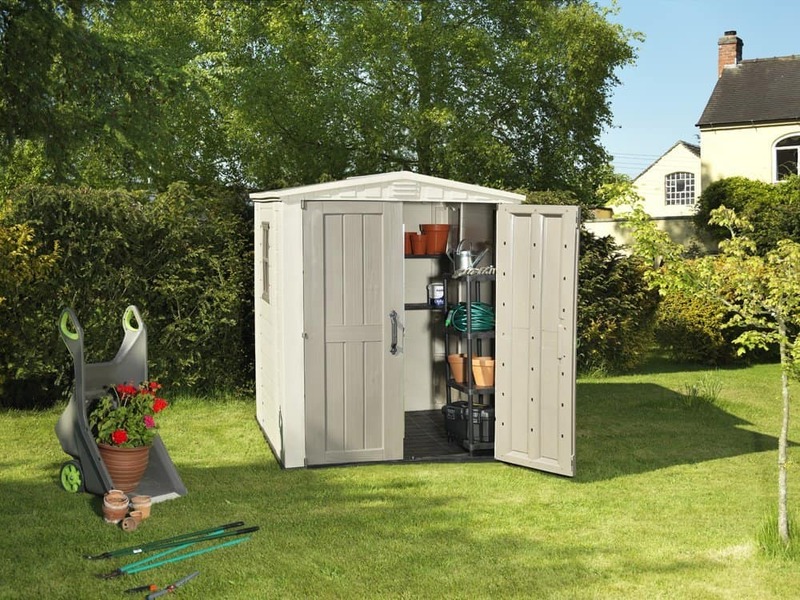 Instead we price the garden sheds and garden buildings we review in a price category and provide you with a link to check the latest prices yourself, you can find this below. Raised tower design that reflects a contemporary design. Numerous windows for adequate ventilation. Solid sheet floor and roof provided. Smaller than it looks on the picture. As you can see from the materials that it has been made of, it is clear that this wooden playhouse is of great quality. It was crafted with natural wood which gives its durability. The outdoor elements such as the harmful ultraviolet rays of the sun and heavy rain will not cause a problem for the natural wood. The raised tower design will further prevent the penetration of water. The pillars are sturdy enough, so there is no need to dig large holes to insert them. The sturdy and fixed windows provide ample protection to withstand strong winds or rain. The roof will also play a role in shielding the windows against storm damage. Although it feels light, the materials are sturdy. The wood is interlocked. This gives extra reassurances that it will protect the inside against any water penetration. Once installed, the wooden playhouse will not be shaken or destroyed by the blowing winds because of the use of premium quality materials. 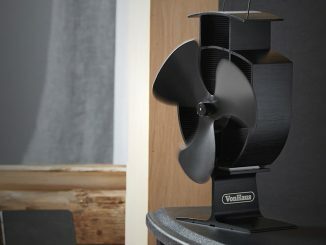 It will last a long time in your garden without the need to replace it or move it to another wind-free location. A natural wood finish has been applied to the playhouse, so it won’t deteriorate rapidly as a result of the exposure to sunlight or rain. The dark grey sand felt roof will also plays a role in protecting it from the sun. One major concern of every parent in children’s playhouses is their safety. This wooden playhouse has made safety a priority. However, please ensure you check the maximum supported weight to make sure you don’t have too many children in it at once. 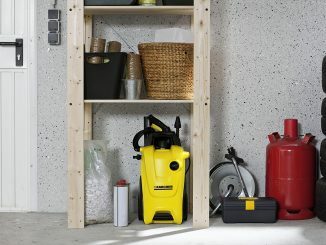 The product was designed for domestic use only, not for commercial purposes. Apart from that, your children will play safely in this playhouse and have lots of fun! The age restriction is for children above 3 years old. This is to ensure they are able to climb the playhouse safely and not fall out with ease. The 4 x 4 green slide is safe for kids to slide down from the raised tower design and we can assure you it is a lot of fun! In addition to that, there is a traditional ladder to easily access the wooden playhouse on the other side. All these do not pose safety problems to your children and have been designed to allow safe access to the playhouse. Should it rain while children are playing in this playhouse, parents should not worry as it has a solid sheet roof to protect the children from the rain. No rain can penetrate the wood, unless of course it comes through the windows or the door, if they have been left open for ventilation purposes. The good quality of natural wood provides maximum safety for kids to play in this playhouse. It is also EN 71 safety approved. Yes, this BillyOh wooden playhouse has a guarantee. It comes with a 5-year anti-rot warranty. That’s a plus to parents as when paying out just over £300, it would be nice to see that your children can have many years of fun from it. The warranty gives you the piece of mind you need when purchasing a children’s wooden playhouse. Any rot within the 5 years period will be covered by the company. Natural wood is good, but if not being taken care of, it can gradually deteriorate. Read the instruction manual on the best method to treat your wooden playhouse. 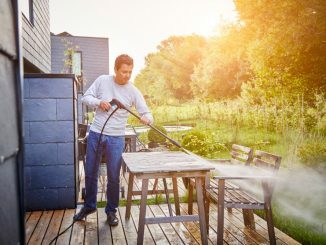 Even after the warranty has elapsed, it is cost-effective and simple to maintain or repair this wooden playhouse should it get damaged. We just hate spending days installing or assembling a playhouse. Fortunately it is not the case with this wooden playhouse as it is with others. However, it might take you a little longer if you are doing it alone. 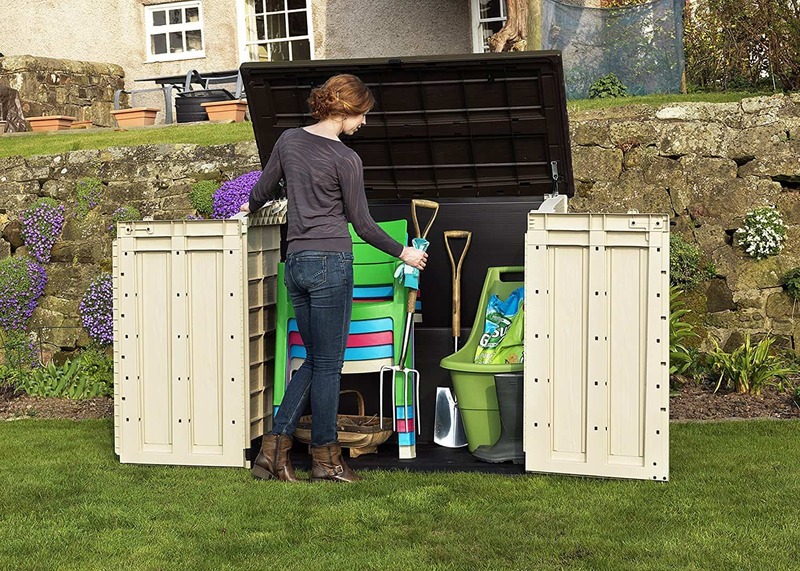 We recommend having a like-minded person to assemble and install this playhouse with. You do not need to spend money on hiring profesionals. The instructions are laid out simply with directions and illustrations. By looking at the picture alone; you can still achieve more by assembling and installing. On average you are looking at around 4 hours to assemble this wooden playhouse. 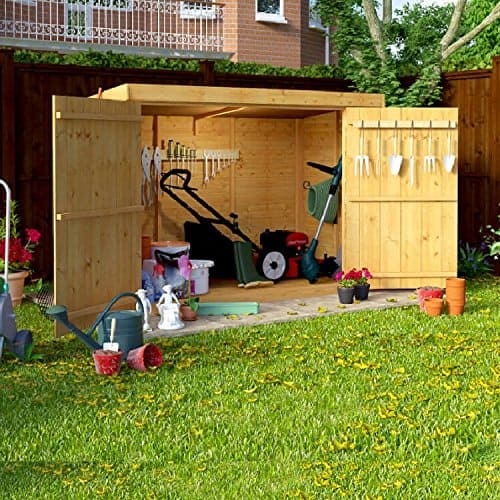 At Garden Shed Reviews, we are very impressed with this wooden playhouse. 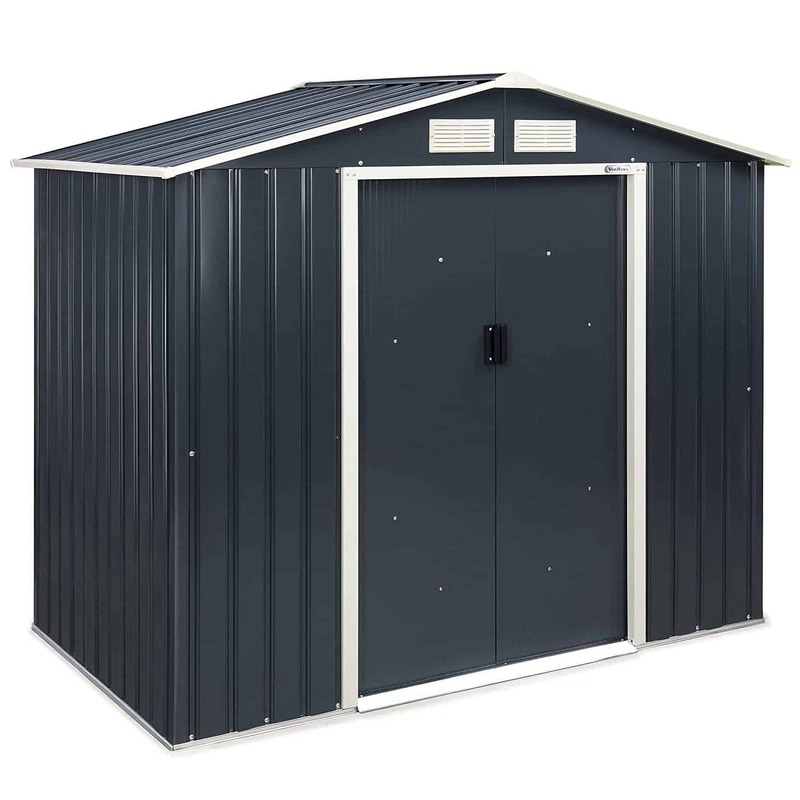 It has great features that we would recommend to any parents out there looking for a top-notch quality and safe playhouse. The inclusion of 4 fixed windows and a door enhances ventilation and give the playhouse an aesthetic appeal. It comes complete with other features such as the dark grey sand felt roof that protects against rain and UV. 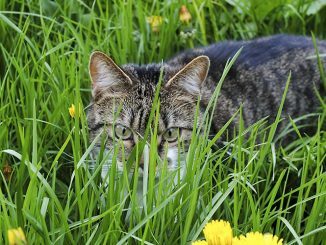 All these considerations are worth it when ensuring the safety of your loved younger ones. The only drawback we raise is the fairly expensive price tag versus a small wooden playhouse. However, it is a great investment!